First of all I’ve never understood why people care wether a given cup of sugar come from sugar cane or sugar beets. Regardless of source, white sugar is at least 99.9 percent pure* sucrose. 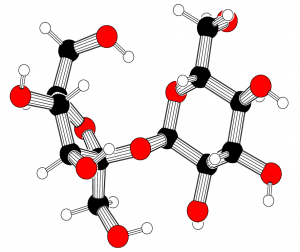 Sucrose is a single molecule with an exact structure that is the same regardless of source. (Like salt crystals, or de-ionized water it’s a pure substance, only one step up from elements like carbon and oxygen). A model of the sucrose molecule. All sucrose, regardless of source, will have this same structure. If it doesn't, it's not sucrose. Image from wikimedia and distributed under the creative commons 3.0 share alike license. 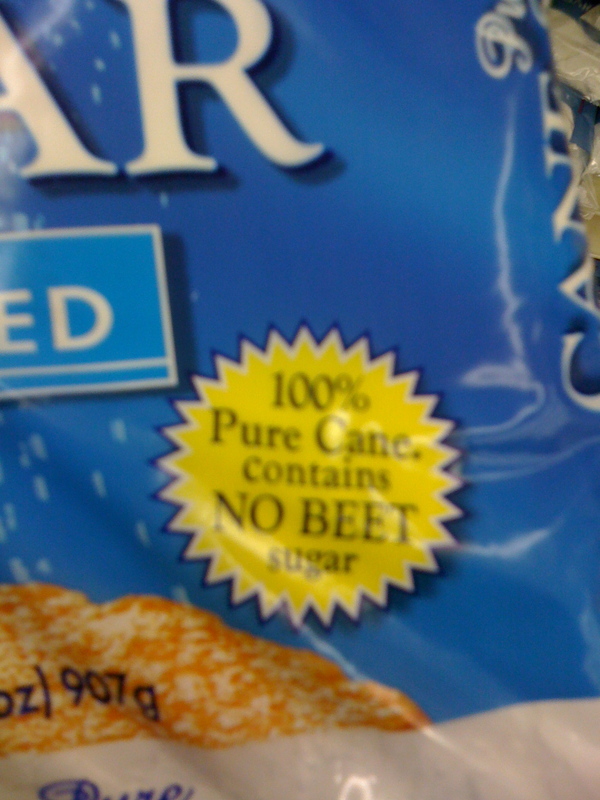 That said, I’ve never before seen a label on a bag of sugar that proudly announced what it is NOT (beet sugar). I don’t know if this is a reaction to the current publicity about herbicide resistant sugar beets, or the old feelings about the, non-existent, differences between sugars refined from different plant sources taken to their logical extreme, but either way, in this christmas of all christmases, is not the time to be kicking beet farmers when they are down. Early this fall Jeffery White, a federal judge based in San Francisco, ruled that the approval of herbicide resistant sugar beets was invalid because the environmental impact report didn’t take into account economic effects. Even though his ruling raised absolutely no concerns about the safety of beet sugar, the ruling in one stroke delivered a huge a publicity boon to anti-GMO groups that are trying to frighten Americans away from beet sugar, and left sugar beet producers unsure if they would even be able to sell this year’s crop, let alone whether they would be allowed to plant next year’s. While it looks like farmers have indeed been allowed to sell this year’s crop, it remains an open question if there will be enough seed that meets the new restrictions imposed by this ruling to continue sugar beet production for the next two years. Given that in 2007, farmers produced over 7 million pounds of sugar beet seeds to plant over one and a quarter million acres of sugar beets, finding enough seed to keep planting for two years without new production (new non-GM sugar beet seed will take two years to begin production**) is no trivial task. All in all it has been a tough year for sugar beet farmers. My thoughts are with them, and, while I can’t do much, I did at least hunt down some powdered sugar I’ve since been told confectioners and powdered sugar are the same thing anyway which made no statements about its crop of origin rather than support the company whose packaging is pictured above. If you celebrate Christmas, have a Merry Christmas. If you don’t, I hope you’re having a great time anyway. *20 pounds of white sugar contains less than one teaspoon of anything other than the molecule sucrose. **Sugar beets are biennial, and since seed companies can’t plant new seed beets in reaction to the Judge White’s ruling until this spring, an increase in non-herbicide resistant beet seed production won’t result in any new seed until the planting season of 2011. For more on the subject, see this news report. So much animosity, I really had no idea until I started reading your blog. I think you’re doing an excellent job of spreading the truth about science, in an easy-to-understand way. Thanks, James! And Merry Christmas! Thank You Liza. It’s great to be back, and Merry Christmas to you as well. Maybe it’s a cultural thing. Isn’t most sugar cane from Hawai’i while sugar beets are used most every where else sugar is produced. Perhaps sugar cane is more “American.” I could be totally wrong though. Happy holidays! I would have expected if anything it’d be the opposite, much beet sugar comes from places like Michigan and Minnesota while I remember reading some poll about the shocking number of people in the US who thought Hawai’i was a foreign country. But it wouldn’t be the first time I used logic to end up completely wrong about what being “more american” would be. And clearly it is SOMETHING cultural. Also, yours was the 300th comment I’ve received on this site, thank you! Happy holidays.